The Commission leads a 14-hour training grounded in Biblical scripture and based on Episcopal Church teaching. The training is open to all persons who would like to deepen their understanding of racism, prejudice, and privilege — and offers strategies to confront them. It is mandatory for clergy, wardens, and other designated leaders of the Episcopal Diocese of Missouri, but will be valuable for anyone. There is no cost for this two-day training; lunch, beverages, and snacks are included. Registration required. This is the REQUIRED workshop for all clergy, persons seeking ordination, youth workers, employees, and wardens. It is suggested training for any lay leadership in the Diocese of Missouri. This two-day workshop will account for 14 hours of canonically required training. There is no cost for this workshop. The training is an intense two-day workshop which includes historic and current material, multimedia, small groups, role plays, facilitated dialogue, and spiritual nourishment. Dismantling racism training was mandated by the 73rd General Convention of the Episcopal Church in 2000 (Resolution B049), and the diocesan Commission for Dismantling Racism offers workshops on recognizing and eliminating institutional racism in the Church. Workshops are free and include lunch and refreshments. Space in this training is limited to thirty participants and training will occur with a minimum of fifteen registrations. The commission generally holds at least one training in the St. Louis metro area and partners with one additional diocesan community outside of the metro area. An additional training is being planned in the metro St. Louis area for late summer 2018, details to follow. 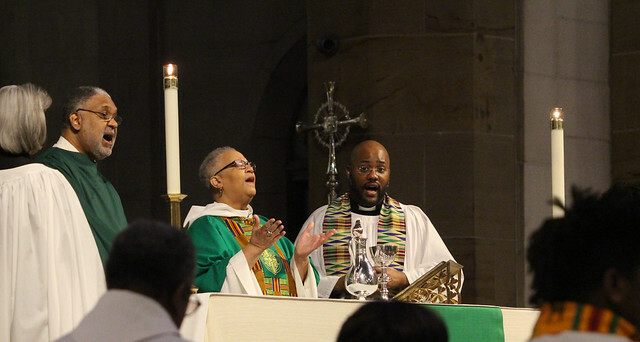 "A Liberating Presence: 200 Years of Black Episcopal Witness in Missouri"
The 2019 Absalom Jones Commemoration was a Eucharistic celebration, in conjunction with the Cathedral’s 200th anniversary celebration. The Commission organizes for the diocese the annual celebration of the life and ministry of Absalom Jones, the first African American ordained as priest in the US. Typically held in February. A finding guide by broad category is available in DOCX or PDF. Absalom Jones commemoration this year is a eucharistic service with Dr. Priscilla Dowden-White speaking on "A Liberating Presence: 200 Years of Black Episcopal Witness in Missouri." For its third annual celebration of raising racial awareness throughout the diocese, the Commission on Dismantling Racism will use Becoming Beloved Community as a platform for this year's event on Dec. 1, 2018. Contact: the Rev. Chester Hines, chair, Dismantling Racism Commission. Additional commission contacts listed below.